Ward and I have been talking about taking the kids to their first Red Sox game this summer for quite some time. Then I received an email yesterday asking me to try out ScoreBig. ScoreBig is just that. It's a ticket selling venue that offers it's customers tickets to concerts, theater events, or sporting events a savings of up to 60%. I have found a place where I can get tickets to the Red Sox at incredibly affordable prices for all four of us! So, guess what? We're taking the kids to see their first Red Sox game as soon as school let's out in June. Now, it's incredibly easy to get tickets at ScoreBig. First, just type in your zip code on the top of the page and then choose your event. I immediately knew I was going to be looking for Red Sox tickets. But there are many other options available on the site. For New England folks, there's Bruins and Celtics games as well. Not sure what ScoreBig has available in your area? Check it out for yourself! Next, decide how many tickets you are looking for. Of course, since we're a family of four, I chose 4. Then you decide where you want to sit, based on the tickets available. 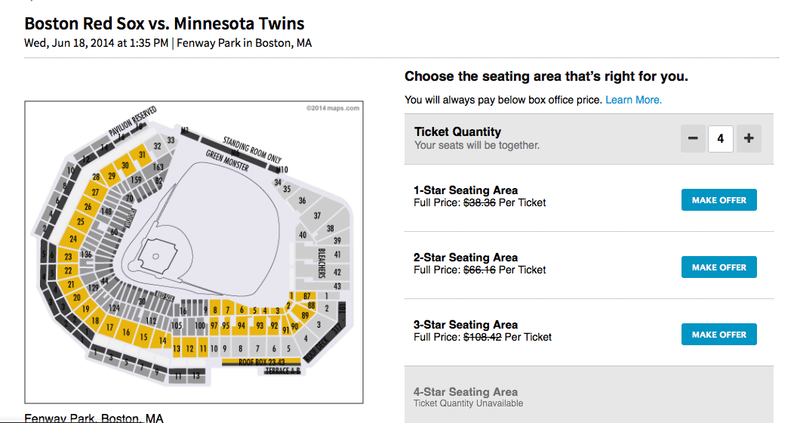 I liked how when you clicked on the different "star" seating areas, the website showed you the pricing areas. After you choose the seating area you would like, click on "make offer". If you are new to the site, you'll need to create an account. But that doesn't take a lot of time at all. Put in your price and you know within seconds if your offer is accepted. Some other awesome facts - you are not charged outrageous fees either. No delivery fees. I for one and getting rather tired of fees for this and fees for that. To be able to purchase tickets online with no extra fees is an extra bonus. Check out ScoreBig on Facebook, twitter, and the ScoreBig blog. Have you ever tried ScoreBig before? Disclaimer: I was provided with a promo code towards the purchase of event tickets from ScoreBig to try out their website. Of course, all opinions expressed on my blog are 100% my own.